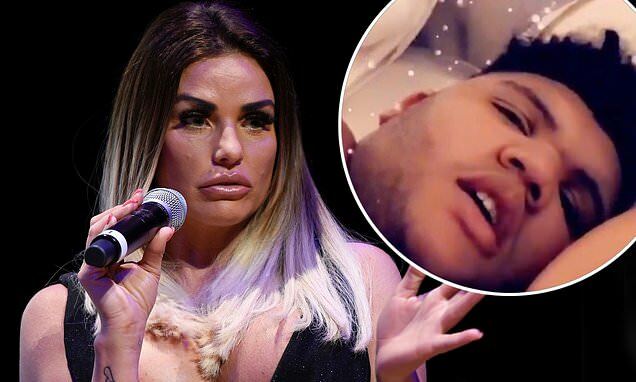 Katie Price didn't leave her son Harvey's side when they lay in bed together all night after she reportedly told pals she's dumping Kris Boyson as he jet off on holiday. The mother-of-five, 40, shared the sweet exchange with her eldest child, whom she shares with her ex Dwight Yorke, in her bedroom on Thursday via Instagram. While Katie was behind the camera lens, 16-year-old Harvey got comfortable under the covers in Katie's bed as they enjoyed quality one-on-one time together. In the video, Katie tells her son he's a 'lucky boy' because he's staying in his mum's bed all night and Harvey lovingly responds with a 'love you'. Katie put all her efforts into her family as her romantic partner Kris, 29, jetted out of the country for a sunny holiday. It comes as Katie has reportedly told friends she has 'cold feet' about her future with boyfriend Kris Boyson. The star launched into a candid rant to pals at her close friend Melodie Pope's New Year's Eve wedding, according to a new report from The Sun, admitting she doesn't want to marry Kris because he's 'too controlling'. The mum of five is also alleged to have told her pals she wants to marry for money next time she walks down the aisle, after three failed marriages.